- Take care not to bend or scratch the trim or the panels. 2. 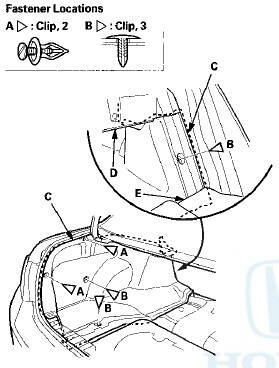 Remove the clip that secures the trunk floor (A) and the seat-back cover (B) to the body. 2-door is shown; 4-door is similar. 3. Remove the trunk floor (A). 4-door is shown; 2-door is similar. 4. Remove the trunk lid weatherstrip near the trunk rear trim panel. 5. Detach the clips (A, B), and release the hooks (C) and the tabs (D) by pulling up the rear trim panel (E), then lemove the panel. 6. 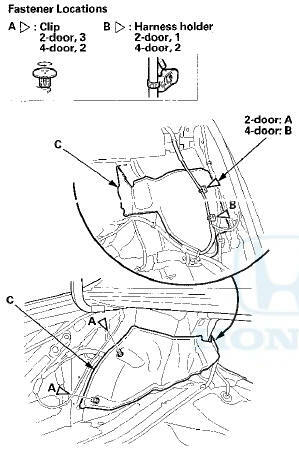 Detach the clips (A, B), and pull out the trunk side trim panel (C) from under the rear shelf (D) and the rear seat-back (E), then remove the panel. 4-door is shown; 2-door is similar. 7. 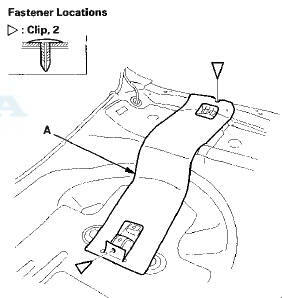 Remove the tool box spacer (A). 4-door is shown; 2-door is similar. 8. Remove the spare tire. 9. Detach the clips, then remove the spare tire pan carpet (A). 4-door is shown; 2-door is similar. 10. 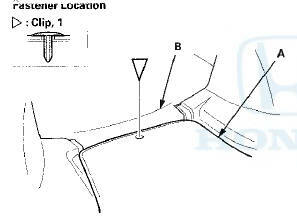 Detach the clips (A) and the harness holders (B) from the stud bolts, then remove the rear wheelhouse insulator (C). 4-door is shown; 2-door is similar. 11. Install the trim in the reverse order of removal, and note these items: - If the clips are damaged or stress-whitened, replace them with new ones.